Hello everyone! Today I wanted to share my glittery nails for this weeks 52 week challenge. This combo would be perfect for one of those holiday parties that require something a little more sophisticated but still fun. The black base gives a sleek look and the glitter is that pop that everyone needs. I paired Revlon Black Lingerie with China Glaze Love Marilyn for the prefect glittery combo. 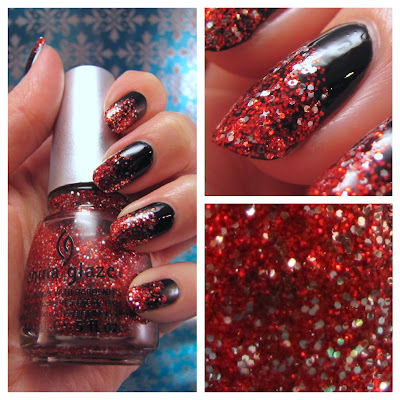 Love Marilyn is a clear base packed with fine bright red glitter and larger silver glitter. Application is great and could easily be worn on its own. I had to remove most of the glitter on the stick to start my gradient. As I added the layers it got easier and easier to get solid coverage. The reflection of the camera darkened the glitter shine, ha! So what do you guys think of the black, red combo for the holidays? I am totally game and love it! I think they paired great together and will certainly use this combo again. Don’t forget to enter the giveaway, only a few days left until the winners are announced. Good luck! Thanks for stopping by today and look forward to seeing you guys again real soon.